عطار, محمدرضا, خواجویان, احسان, داودی, علی. (1397). ایجاد سطوح ابرآبگریز نانو ساختار بر روی آلیاژ آلومینیوم به روش ساده اچ شیمیایی. نشریه علوم و مهندسی سطح, 14(35), 49-58. محمدرضا عطار; احسان خواجویان; علی داودی. "ایجاد سطوح ابرآبگریز نانو ساختار بر روی آلیاژ آلومینیوم به روش ساده اچ شیمیایی". 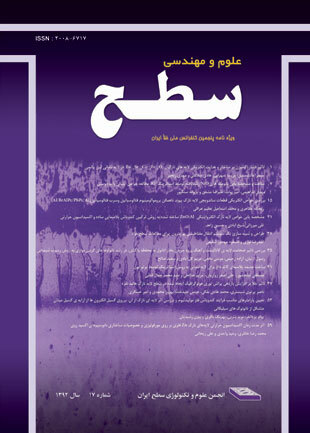 نشریه علوم و مهندسی سطح, 14, 35, 1397, 49-58. عطار, محمدرضا, خواجویان, احسان, داودی, علی. (1397). 'ایجاد سطوح ابرآبگریز نانو ساختار بر روی آلیاژ آلومینیوم به روش ساده اچ شیمیایی', نشریه علوم و مهندسی سطح, 14(35), pp. 49-58. عطار, محمدرضا, خواجویان, احسان, داودی, علی. ایجاد سطوح ابرآبگریز نانو ساختار بر روی آلیاژ آلومینیوم به روش ساده اچ شیمیایی. نشریه علوم و مهندسی سطح, 1397; 14(35): 49-58. در پژوهش حاضر، یک روش مبتکرانه، ساده و کم هزینه برای ایجاد سطح میکرو- نانوساختار ابرآبگریز بر روی آلیاژ آلومینیوم بدون مصرف برق پیشنهاد شد. زاویه تماس قطره آب بر روی سطح ابرآبگریز ایجاد شده °1/167 اندازه گیری شد. میکرو- نانوزبری­های ایجاد شده در سطح به کمک میکروسکوپ الکترونی روبشی مشاهده گردید. آنالیز شیمیایی سطح توسط آنالیز EDS صورت گرفت و حضور ترکیبات با زنجیره­های کربنی مشخص گردید. تأثیر زمان اچ بر روی زاویه تماس نیز بررسی و بهترین زمان 4 دقیقه اندازه گیری شد. محاسبه گردید که 97 درصد سطح ابرآبگریز ایجاد شده که با قطره آب در تماس است، از هوا تشکیل شده است. تست خوردگی پلاریزاسیون پتانسیودینامیک نشان داد که پس از ساخت سطح ابرآبگریز بر روی آلیاژ آلومینیوم، جریان خوردگی از µA/cm2 4/1 بهµA/cm2 7/0 کاهش می­یابد که بیانگر افزایش دو برابری عملکرد آن است. خاصیت خودتمیزشوندگی سطح ابرآبگریز به دست آمده بررسی شد. همچنین مشاهده گردید که سطح ایجاد شده توانایی دفع اکثر مایعات را داراست. 1. R. Ramachandran, K. Sobolev, M. Nosonovsky, Dynamics of droplet impact on hydrophobic/icephobic concrete with the potential for superhydrophobicity, Langmuir : the ACS journal of surfaces and colloids, 31 (2015) 1437-1444. 2. Y. Lu, S. Sathasivam, J. Song, C.R. Crick, C.J. Carmalt, I.P. Parkin, Repellent materials. Robust self-cleaning surfaces that function when exposed to either air or oil, Science (New York, N.Y.), 347 (2015) 1132-1135. 3. E.C. Stancu, M.D. Ionita, S. Vizireanu, A.M. Stanciuc, L. Moldovan, G. Dinescu, Wettability properties of carbon nanowalls layers deposited by a radiofrequency plasma beam discharge, Materials Science and Engineering: B, 169 (2010) 119-122. 4. R.V. Honeychuck, T. Ho, K.J. Wynne, R.A. Nissan, Preparation and characterization of polyurethanes based on a series of fluorinated diols, Chemistry of Materials, 5 (1993) 1299-1306. 5. D.K. Sarkar, M. Farzaneh, Superhydrophobic Coatings with Reduced Ice Adhesion, Journal of Adhesion Science and Technology, 23 (2009) 121237-15. 6. S. Farhadi, M. Farzaneh, S.A. Kulinich, Anti-icing performance of superhydrophobic surfaces, Applied Surface Science, 257 (2011) 6264-6269. 7. B. Bhushan, Y.C. Jung, K. Koch, Self-Cleaning Efficiency of Artificial Superhydrophobic Surfaces, Langmuir : the ACS journal of surfaces and colloids, 25 (2009) 3240-3248. 8. H. Dong, M. Cheng, Y. Zhang, H. Wei, F. Shi, Extraordinary drag-reducing effect of a superhydrophobic coating on a macroscopic model ship at high speed, Journal of Materials Chemistry A, 1 (2013) 5886-5891. 9. G. McHale, M.R. Flynn, M.I. Newton, Plastron induced drag reduction and increased slip on a superhydrophobic sphere, Soft Matter, 7 (2011) 10100-10107. 10. P. Li, X. Chen, G. Yang, L. Yu, P. Zhang, Fabrication and characterization of stable superhydrophobic surface with good friction-reducing performance on Al foil, Applied Surface Science, 300 (2014) 184-190. 11. M. Li, J. Zhai, H. Liu, Y. Song, L. Jiang, D. Zhu, Electrochemical Deposition of Conductive Superhydrophobic Zinc Oxide Thin Films, The Journal of Physical Chemistry B, 107 (2003) 9954-9957. 12. X. Zhang, F. Shi, J. Niu, Y. Jiang, Z. Wang, Superhydrophobic surfaces: from structural control to functional application, Journal of Materials Chemistry, 18 (2008) 633-21..
13. A.B.D. Cassie, S. Baxter, Wettability of porous surfaces, Transactions of the Faraday Society, 40 (1944) 546-551. 14. E. Bittoun, A. Marmur, Optimizing super-hydrophobic surfaces: criteria for comparison of surface topographies, Journal of Adhesion Science and Technology, 23 (2009) 401-411. 15. Y. Liu, T. Tan, B. Wang, R. Zhai, X. Song, E. Li, H. Wang, H. Yan, Fabrication of CdS films with superhydrophobicity by the microwave assisted chemical bath deposition, Journal of colloid and interface science, 320 (2008) 540-547. 16. N. Xu, D.K. Sarkar, X.G. Chen, W.P. Tong, Corrosion performance of superhydrophobic nickel stearate/nickel hydroxide thin films on aluminum alloy by a simple one-step electrodeposition process, Surface and Coatings Technology, 302 (2016) 173-184. 17. M. Ruan, W. Li, B. Wang, Q. Luo, F. Ma, Z. Yu, Optimal conditions for the preparation of superhydrophobic surfaces on al substrates using a simple etching approach, Applied Surface Science, 258 (2012) 7031-7035. 18. N. Saleema, D.K. Sarkar, R.W. Paynter, X.G. Chen, Superhydrophobic Aluminum Alloy Surfaces by a Novel One-Step Process, ACS Applied Materials & Interfaces, 2 (2010) 2500-2502. 19. Y. Huang, D.K. Sarkar, X.-G. Chen, Superhydrophobic nanostructured ZnO thin films on aluminum alloy substrates by electrophoretic deposition process, Applied Surface Science, 327 (2015) 327-334. 20. Q. Li, Y. Yan, M. Yu, B. Song, S. Shi, Y. Gong, Synthesis of polymeric fluorinated sol–gel precursor for fabrication of superhydrophobic coating, Applied Surface Science, 367 (2016) 101-108. 21. L. Song-Mei, L. Bin, L. Jian-Hua, Y. Mei, Corrosion resistance of superhydrophobic film on aluminum alloy surface fabricated by chemical etching and anodization, Chinese Journal of Inorganic Chemistry, 28 (2012) 1755-1762. 22. J. Zhao, L. Xia, A. Sehgal, D. Lu, R.L. McCreery, G.S. Frankel, Effects of chromate and chromate conversion coatings on corrosion of aluminum alloy 2024-T3, Surface and Coatings Technology, 140 (2001) 51-57. 23. E. Hosono, S. Fujihara, I. Honma, H. Zhou, Superhydrophobic perpendicular nanopin film by the bottom-up process, Journal of the American Chemical Society, 127 (2005) 13458-13459. 24. S. Zheng, C. Li, Q. Fu, W. Hu, T. Xiang, Q. Wang, M. Du, X. Liu, Z. Chen, Development of stable superhydrophobic coatings on aluminum surface for corrosion-resistant, self-cleaning, and anti-icing applications, Materials & Design, 93 (2016) 261-270. 25. Y. Huang, D.K. Sarkar, X. Grant Chen, Superhydrophobic aluminum alloy surfaces prepared by chemical etching process and their corrosion resistance properties, Applied Surface Science, 356 (2015) 1012-1024. 26. T. Young, An essay on the cohesion of fluids, Philosophical Transactions of the Royal Society of London, 95 (1805) 65-87. 27. A.T. Gros, R.O. Feuge, Surface and interfacial tensions, viscosities, and other physical properties of some n-aliphatic acids and their methyl and ethyl esters, Journal of the American Oil Chemists Society, 29 (1952) 313-317. 28. N. Vargaftik, B. Volkov, L. Voljak, International tables of the surface tension of water, Journal of Physical and Chemical Reference Data, 12 (1983) 817-820. 29. R. Wu, S. Liang, A. Pan, Z. Yuan, Y. Tang, X. Tan, D. Guan, Y. Yu, Fabrication of nano-structured super-hydrophobic film on aluminum by controllable immersing method, Applied Surface Science, 258 (2012) 5933-5937. 30. H.-J. Li, W.-Z. Fan, H.-H. Pan, C.-W. Wang, J. Qian, Q.-Z. Zhao, Fabrication of “petal effect” surfaces by femtosecond laser-induced forward transfer, Chemical Physics Letters, 667 (2017) 20-24.